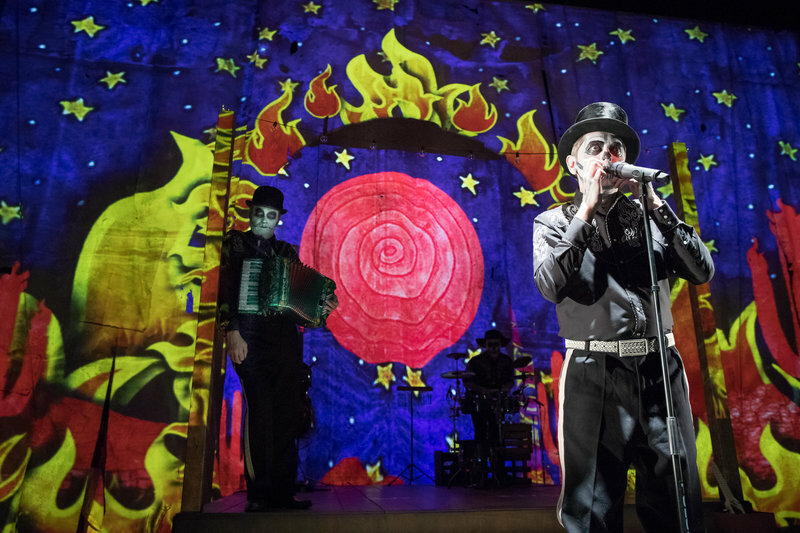 It’s amazing what you can create with a old curtains, make-up, puppets and projections in the world of The Tiger Lillies’ new show Corrido de la Sangre, as part of the ¡Viva! Spanish & Latin American Festival 2018 until 5 May. 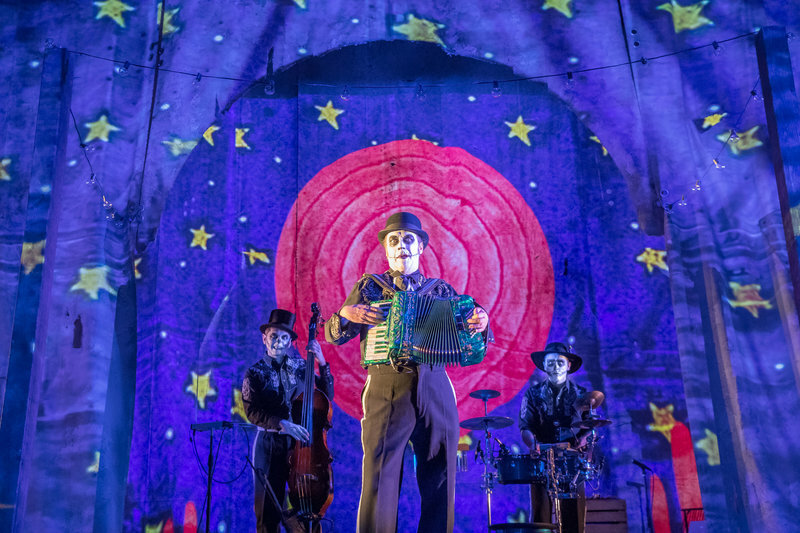 Mixing pre-war Berlin cabaret, anarchic opera and gypsy music, the Tiger Lillies transport the audience to a small dusty town in the lands between Mexico and the United States. 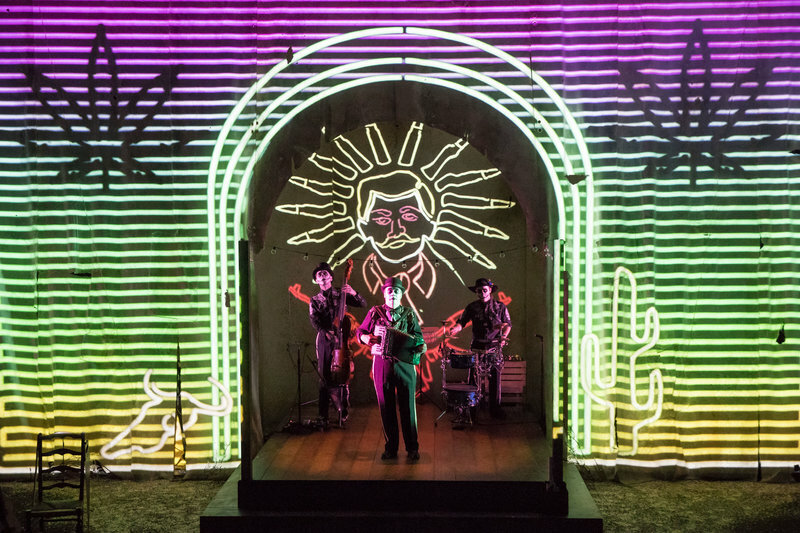 The set is hypnotic, transforming from wood shacks and dusty streets, to luxurious houses with huge pillars and plasterwork, constantly moving, opening up other worlds. Hard to believe that these 3D optical illusions are created by projections on huge distressed backdrops, complete with rips and holes. 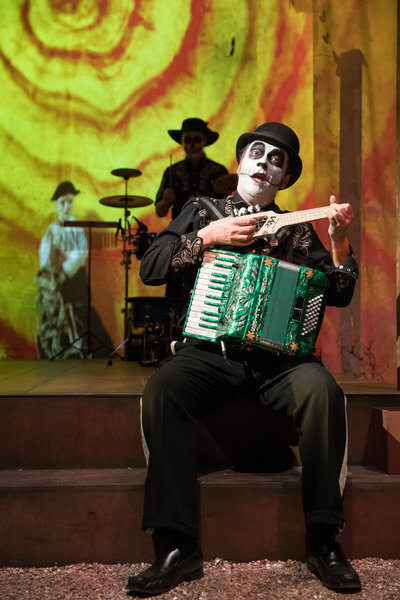 Founder Martin Jaques plays a Corrido singer, revealing the story of his death with his multi-instrumentalist band Adrian Stout and Jonas Golland. 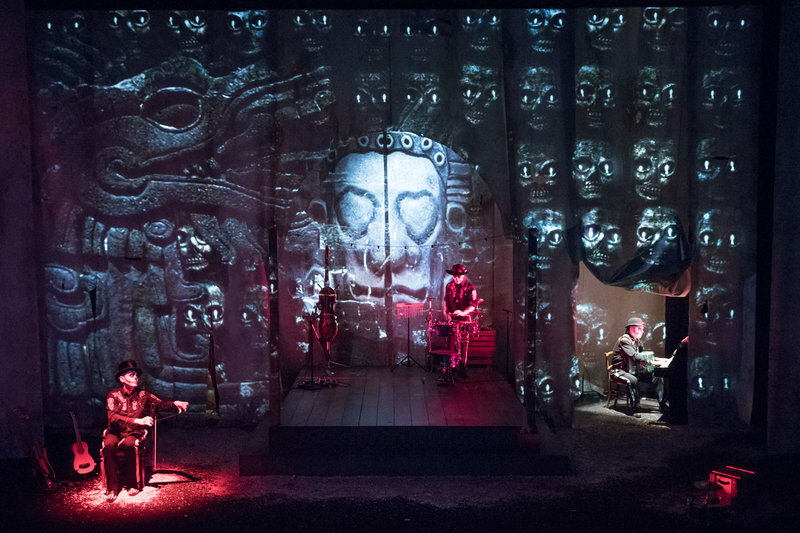 Just like the stunning visuals, the instruments are fascinating. It looks like Martyn is playing the top part of a guitar broken off. 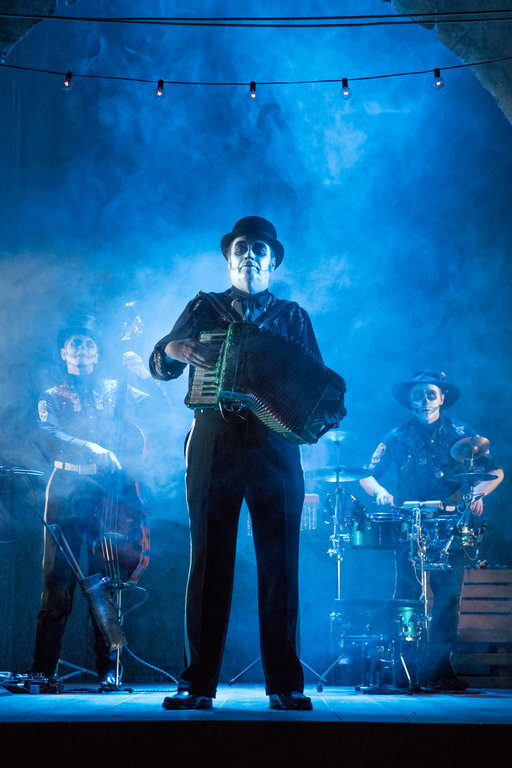 Then there is a musical saw, jaw harp, theremin, harmonica, accordion, piano, guitar, cow bell, drums and a tambourine worn on a boot, of course. 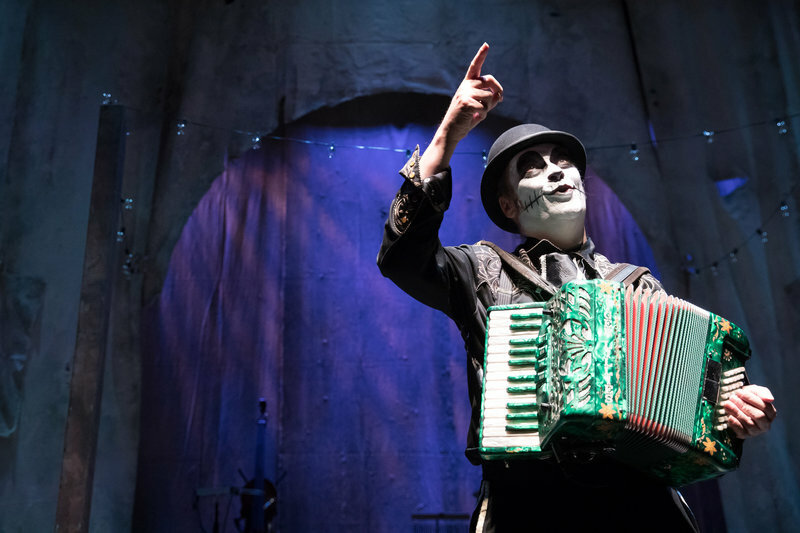 With their heavy skeleton make-up, the Tiger Lillies have returned from the realm of the dead to haunt their killer and tell us their dark story of intrigue, vengeance, murder and the mayhem of a romance gone bad. 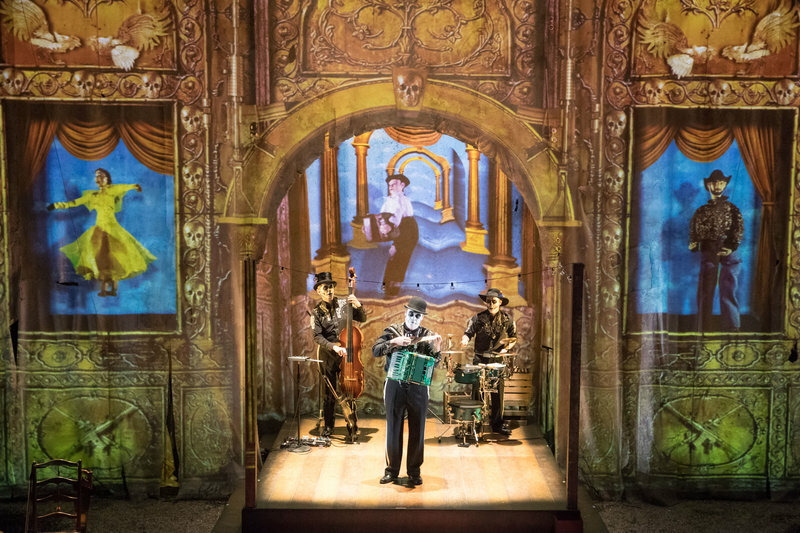 There are only three people on stage but behind them are a massive cast of puppets, papercut artwork and shadow puppets playing a knight, an evil king, battling drug cartels, a depressed drunken doctor, a damsel in distress and the Saint of the Sinners. These are created by Mexican artists Alberto Orozco Family Marionettes and Francisco Estrada, conceived and created in Hacienda Santa Barbara Huamantla, Mexico. 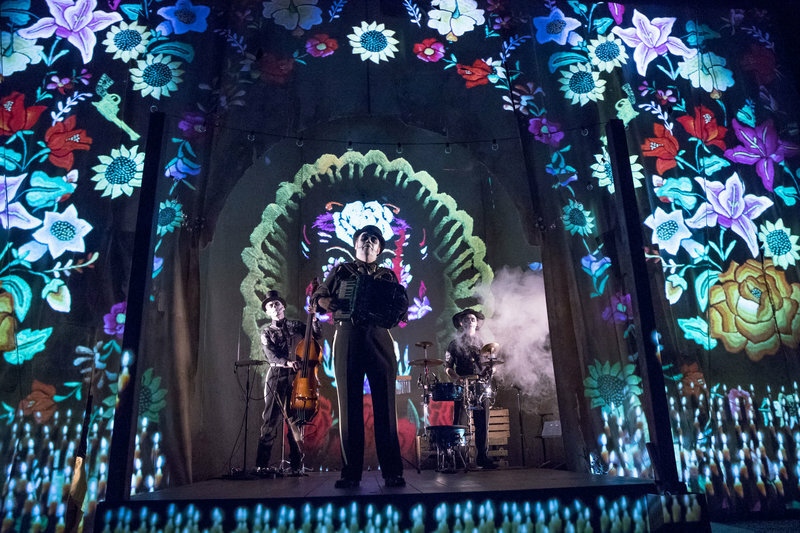 Astrid Hadad creates the voiceover, with projected English subtitles at the top of the stage, although all the original songs by the Grammy-nominated Tiger Lillies are sung in English. 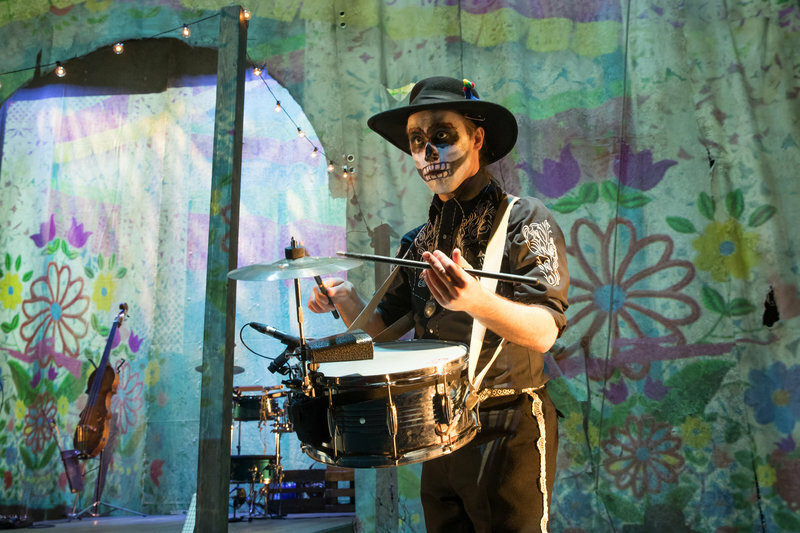 Prepare to be immersed in a world of skulls, skeletons and sadness, but also warped humour and double entendres – in a bawdy grab your crotch Shakespearean-style, served with swearing, blood splatter and a feminist twist of revenge. 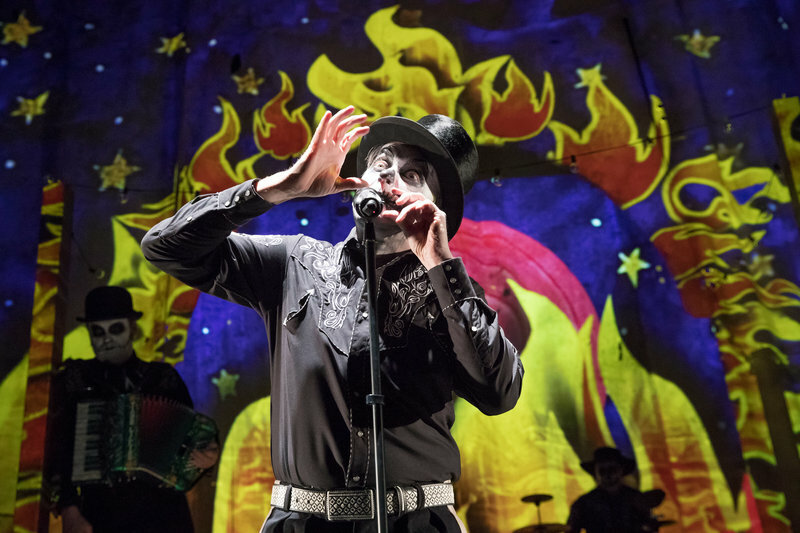 For more details on the film, theatre and other visual art events from across Spain, Latin America and beyond, at HOME until Saturday 5 May, click here: ¡Viva! Festival 2018. Photos below by Jonathan Keenan.